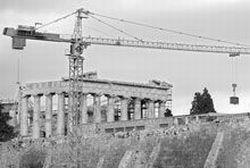 Swaddled in white drop cloths, hundreds of sculptural masterpieces from the Acropolis are waiting to be delicately lifted by crane to a new, glass and concrete Museum nearing completion at the foot of the ancient citadel. 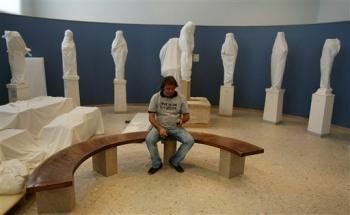 In just a few days, on October 14, officials plan to start whisking some 4,500 artifacts from the old, cramped Acropolis Museum. 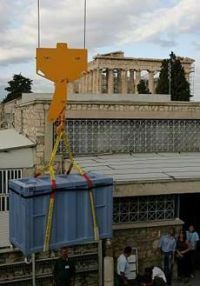 It will be the first time the artifacts, some of which are considered among the most important works of antiquity, have been moved from the site. A trial run will be held next week. The first piece to make the 400-meter journey will be a 2.5-ton marble block from the Parthenon frieze, a 2,500-year-old sculpted strip depicting a religious procession that ran around the ancient temple just below roof level. “This is one of the biggest and the least fragmented of all the blocks in the frieze”, senior conservator Dimitris Maraziotis told The Associated Press. Supervising engineer Costas Zambas said the transfer will take at least a month and a half, although bad weather could prolong the operation. It will cost 2.5 million euros. 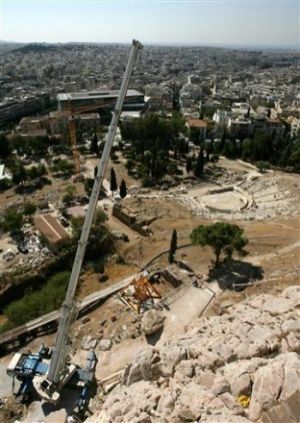 Using three cranes up to 50 meters high, a team of 35 workers will relay the priceless artifacts, mostly from the 6th and 5th centuries B.C., off the Acropolis hill into the purpose-built new Museum. 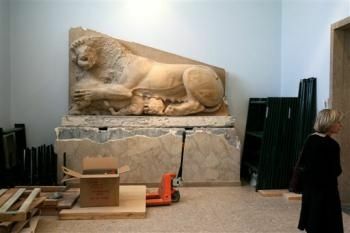 “Every single part of the operation will be difficult and requires great care” said Zambas, a veteran of the long-running Acropolis restoration project who was involved in removing the remaining sculptures from the Erechtheion and Parthenon temples for display in the old Museum. Wearing padded harnesses, the sculptures will be hoisted into styrofoam-filled boxes made of plywood and metal. Each crate will take up to 2½ hours to reach the new Museum, traveling just a few meters above ground level, according to Zambas. Up to four crates will make the trip every day. Beyond the creation of an architectural landmark in its own right, there are political aims behind the long-delayed 129 million euros Museum. 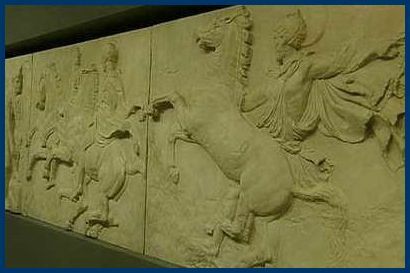 Greece hopes the new building’s top-level display conditions might propel the country’s decades-old campaign to regain the Parthenon Marbles, stolen 200 years ago by Lord Elgin, a British diplomat, and currently on display at the British Museum. The London museum refuses to return the works, but Greece has proposed that they should be displayed in Athens, alongside the remaining sections, as a long-term loan. 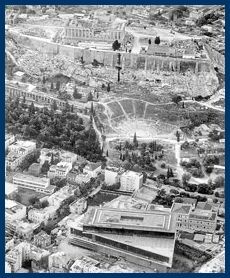 Initially scheduled for completion before the 2004 Athens Olympics, the new, 20,000-square meter Museum was delayed by legal fights and new archaeological discoveries at the site, many of which will be visible under glass floors. It will contain more than 4,000 works, 10 times the number on display in the old Museum. The two-story building was designed by U.S.-based architect Bernard Tschumi in collaboration with Greece’s Michalis Photiadis. 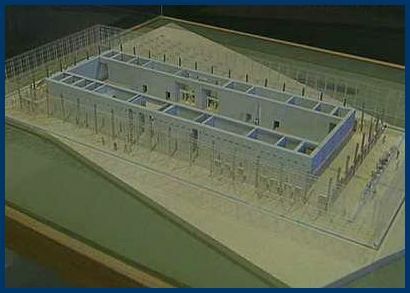 The building will be capped by a glass hall containing the Parthenon sculptures. The glass walls will allow visitors a direct view of the ancient temple. The new Museum is expected to open in sections next year, but the full collections will go on view before 2009.